NEW YORK, Aug. 22, 2018 – The Capital City Go-Go (Washington Wizards) today obtained the rights to 14 players in the 2018 NBA G League Expansion Draft. The team will hold the rights to those players for two seasons. Capital City’s selections in the Expansion Draft came from a pool of players from 2016-17 and 2017-18 NBA G League rosters. 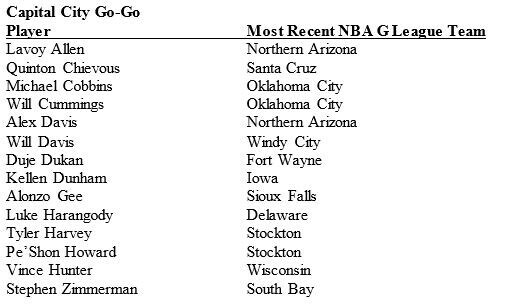 Each 2017-18 NBA G League team was able to protect the rights of up to 12 players. Capital City was able to select up to 14 unprotected players, with no more than two selections coming from any one NBA G League team.